While Cletus presumably had a small ‘c’ in mind when he delivered that warning, the ominous line makes it clear that Venom’s archenemy Carnage is just one movie away from entering the fray. But while Cletus has yet to be afflicted with the symbiote that’ll turn him into the famed supervillain, a notebook exhibited at New York Comic Con makes it clear that he doesn’t need alien enhancements to be a pretty dangerous guy. 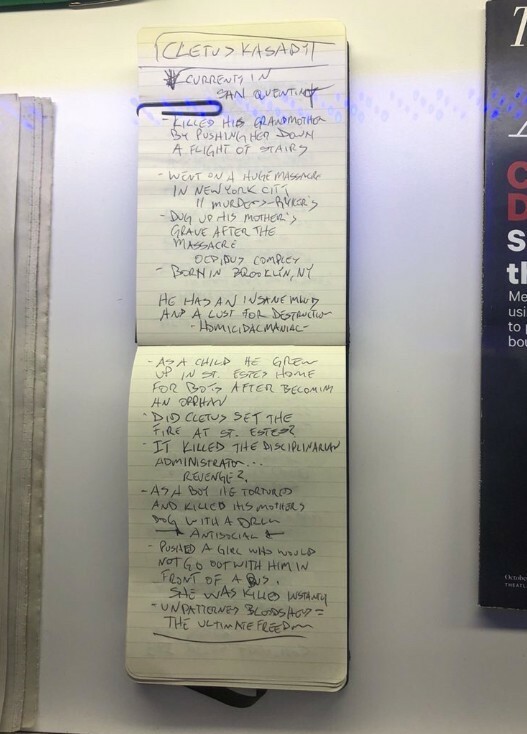 These notes were written by investigative journalist Eddie Brock, who presumably scribbled them in advance of meeting Cletus in San Quentin prison at the end of Venom. Sure enough, it wasn’t exactly petty theft that put Cletus in his cell, with the psychotic character having left a trail of bodies across New York and even Ryker’s maximum security penitentiary. The notes also indicate a complicated relationship with his family, as Cletus reportedly killed his grandmother by pushing her down a flight of stairs and once dug up his mother’s grave. On top of that, he apparently killed his mother’s dog with a drill and pushed a girl in front of a bus when she refused to go out with him. As an orphan, Cletus grew up in St. Estes Home for Boys, and almost certainly started a fire in the building that killed the Disciplinarian Administrator. Needless to say, Cletus has had a pretty gruesome track record, but if you’re expecting to be privy to such horrific sights in Venom 2, bear in mind that producer Avi Arad has already heavily implied that the sequel will be a PG-13. There’s indeed gonna be carnage, but only of the kind that the kids can go see.